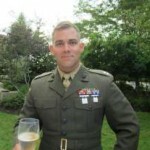 A southern California native and 2006 graduate of the United States Naval Academy, Michael served eight years in the Marine Corps as an artillery officer. He deployed to Iraq with 2/11 as a Civil Affairs Team Leader and to Afghanistan with 1/11 as the Battalion Assistant Operations Officer. In his his last assignment, as an instructor at the Field Artillery Basic Officer Leadership Course, he successfully instructed 180 Army and Marine Corps Lieutenants on Fire Support. Michael currently works for a global leader in flexible plastic packaging as a Tactical Marketing Manager while also attending the University of Chicago Booth part time, and he expects to complete his MBA in summer 2017.